If you had the chance to be immortal, would you take it? 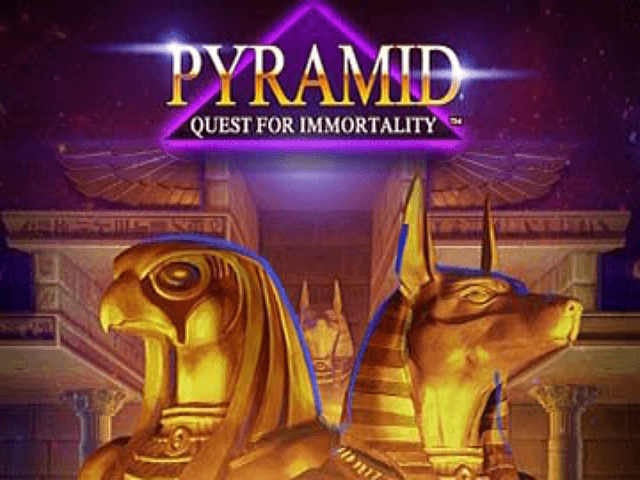 Admittedly, that's a rather philosophical and rhetorical question to start this Pyramid: Quest for Immortality slot review, but it's at the heart of the game. The Ancient Egyptians believed deceased pharaohs would be reborn and therefore live forever, so they were buried in their tombs with all their worldly possessions. Games maker NetEnt has tapped into that theory with this colourful slot outing, and while it can’t guarantee players immortality it can at least enhance their chances of riches by offering up a jackpot prize of a staggering 3.6 million coins! 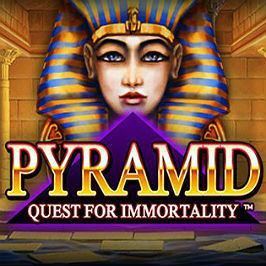 Play Pyramid: Quest for Immortality for Real Money! If those prizes seem relatively low, that could be because of the generosity of the pay-outs attached to the wild symbol and avalanche multipliers, as we'll find out later in this review. To set your stake as you want it, you can make the most of the ‘Level’ button that replaces the traditional coin or bet amount functions. You have ten levels to choose from, and each is attached to your bet per spin. But the coin value can also be edited, with amounts ranging from 0.01 per spin to 2.00 available. You can always opt for the Max Bet option if you’re feeling lucky. To speed up your bets there is an autoplay function available. This is great because not only will it spin the reels on your behalf, it also offers advanced settings such as stopping autoplay when you win or if your cash increases/decreases by a certain amount. 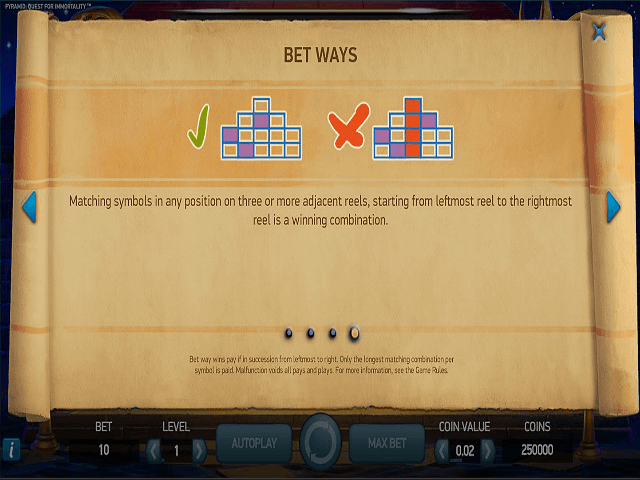 The standard wild symbol in the Pyramid: Quest for Immortality slot machine substitutes for all other icons to create winning combinations, and its sister wild – named the wild generation – will turn wild if it appears on reels two, three or four and drops on to the gameboard courtesy of an avalanche. Ah yes, those avalanches. NetEnt has introduced its ever-popular feature into this 3D spinner, whereby winning symbols disappear as they are replaced by an avalanche of new ones falling from above. 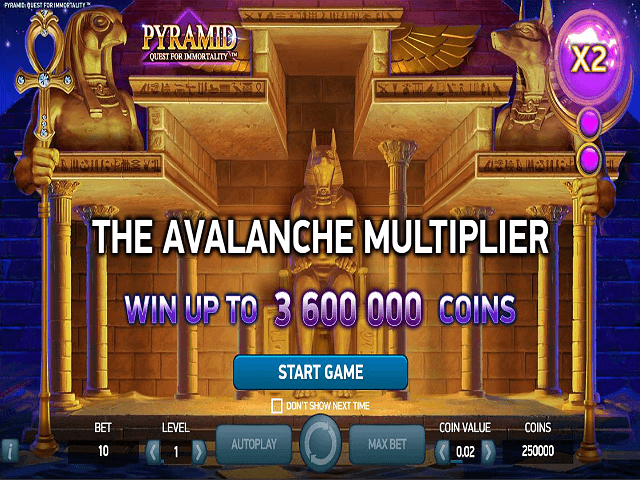 Each time you land three consecutive winning spins courtesy of the avalanche affect your multiplier increases by one-times, up to a maximum of ten-times. Share this Pyramid: Quest for Immortality Review today! 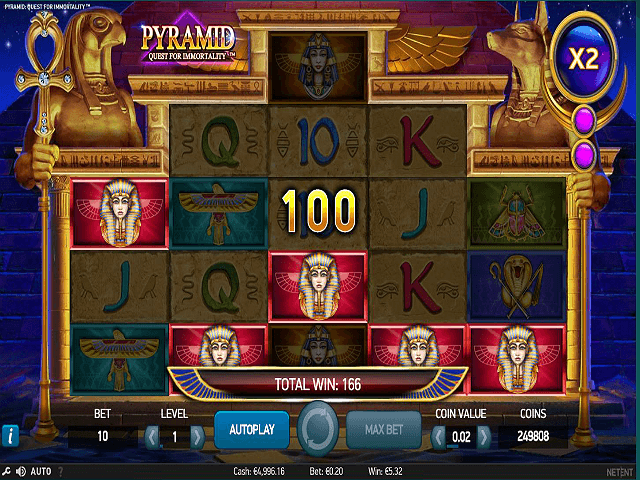 If you like Pyramid: Quest for Immortality, you'll love these slot titles too!